This is a reproduction of a real treasury item dating back to the early 900s, made in cooperation with the best artisans of wrought iron from Florence, Italy. 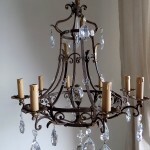 It has a splendid wrought iron birdcage shape covered with wonderful original glass florettes and enriched with Macaroni beads swags. one light at the center. 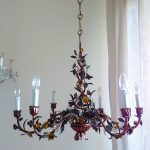 It has Murano yellow glass and lilac drops and is a one-of-a-kind treasury item. It has been completely renewed and rewired, so now it is a ready-to-use tresury item from Italy. in excellent vintage conditions. ORIGINAL chain and tole canopy included. MATCHING yellow gold tassel tiebacks with lilac drops – available! To be hung at the wall, no plug in system.